Awkward block letters printed in the hand of a six-year-old ghost child. Annie Mary Twente of Hanska. Annie Mary, buried alive in 1886 in Albin Township. Annie Mary, her body later exhumed to reveal scratch marks inside the lid of her wooden coffin. Supposedly a true story and one that once scared me enough to unwisely admit as much to my Aunt Marilyn. 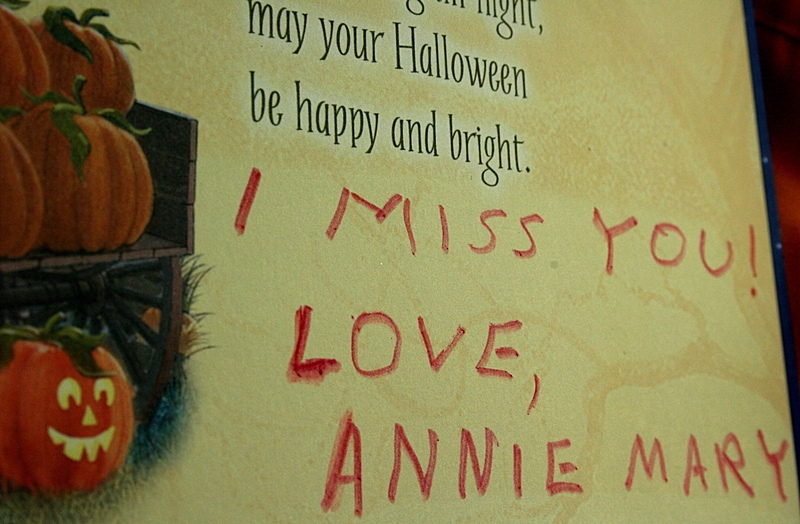 Each Halloween Annie Mary purchases and signs a greeting card, addresses the envelope and drops it in the mail to me. Oh, lucky, lucky me. But if she wouldn’t send a card, I’d be disappointed. Some Halloweens I forget about Annie Mary, until I pull an envelope from my mailbox to read “A.M.” printed in the upper left return address corner. 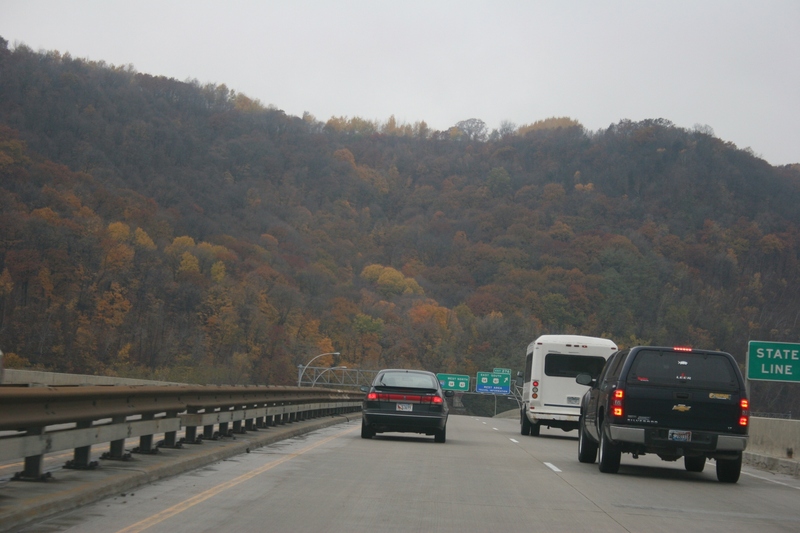 Hillsides of colorful trees along I-90 in southeastern Minnesota Sunday morning. I DID NOT EXPECT IT—leaves rusting under a gloomy, grey sky which gripped the second to last day of October like an iron fist. Autumn seemed determined to hang on, to stand strong and sturdy against winter for one final weekend. And it was a glorious one. Not glorious in the sense of sunny skies and warm weather. 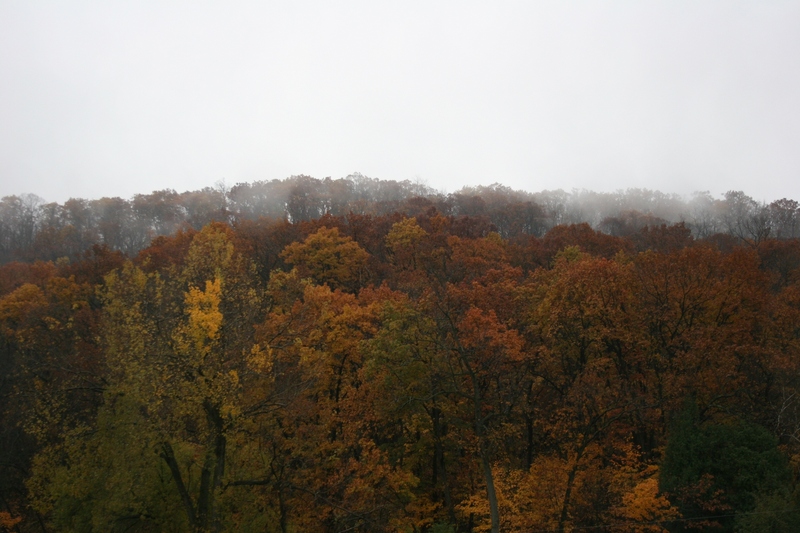 But beautiful and wondrous and spectacular in the surreal scene of clouds and wisps of fog that pressed against the wooded Mississippi River bluffs along Interstate 90 in southeastern Minnesota Sunday. 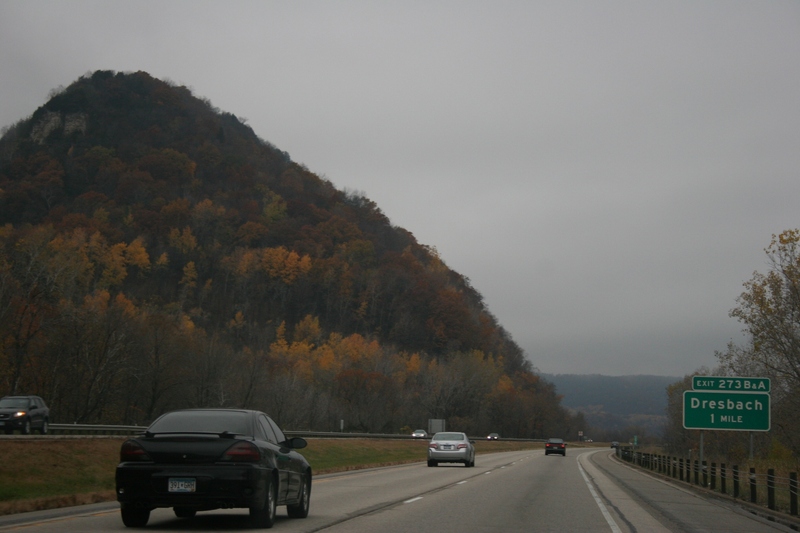 As my husband and I traveled through the area between Nodine, Minnesota, and La Crosse, Wisconsin, and onto Tomah, I couldn’t take my eyes off the hillsides of trees shaded in muted hues of rust and moss green and the occasional spark of golden yellow. I did not expect this so-late-in-October autumn beauty. Despite the drive day of off-again, on-again rain and mist and pressing-down-upon-you iron grey skies, I felt myself appreciating the irrepressible beauty of the natural world around me. Even on the dreariest of days, around each curve in the highway, a new scene unfolded and I couldn’t stop taking pictures between swipes of the windshield wiper blades. 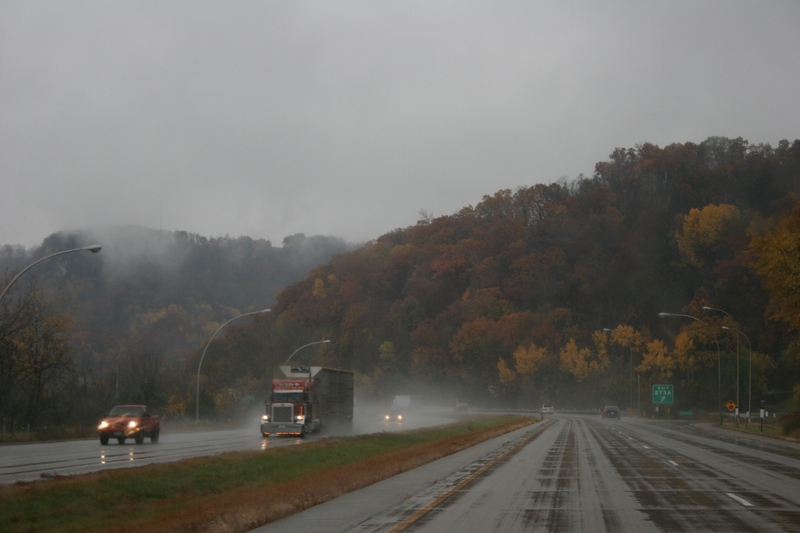 Driving I-90 near Dresbach, heading toward La Crosse, fog shrouded the wooded bluffs. 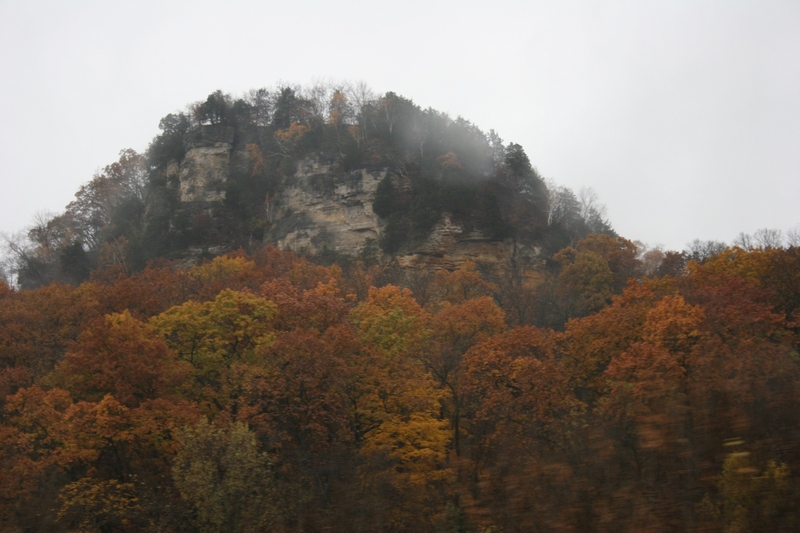 Woods fade into sky into stone in this surreal setting Sunday morning near La Crosse. 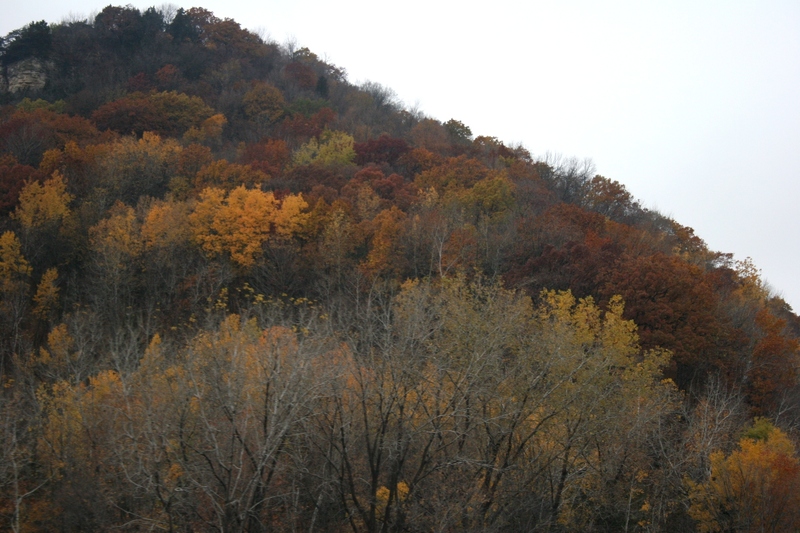 And then, several hours later, we saw the same trees from a different perspective as we drove back from Tomah. Here we are driving into Minnesota from La Crosse. 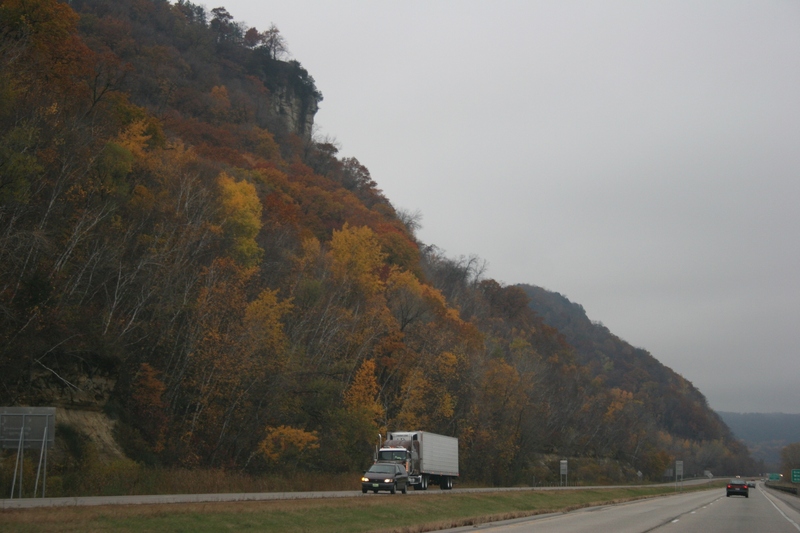 I-90 hugs the bluffs on one side, the Mississippi River on the other along this picturesque stretch of winding roadway between the border and Dresbach. What most surprised me were all the leaves still clinging to branches. I expected most would have been blown off by fierce autumn winds. And the colors, oh, the rust of oaks, so beautiful. 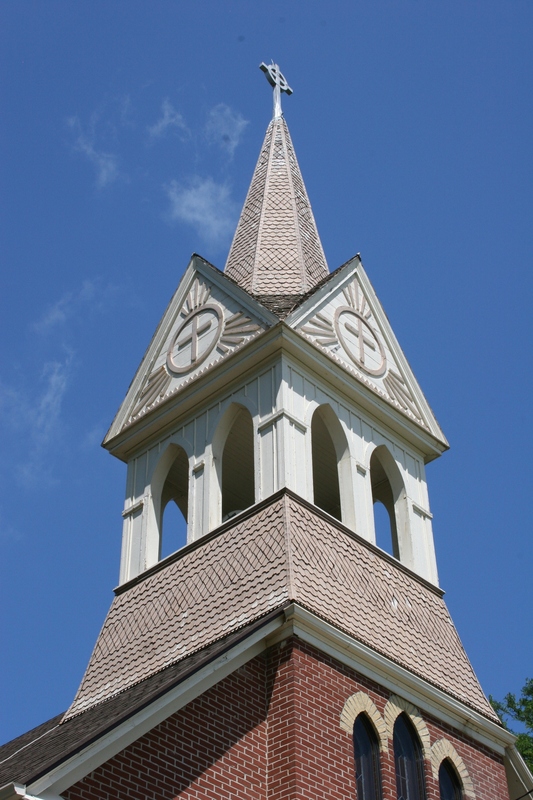 The steeple of Vista Evangelical Lutheran Church near New Richland, not to be confused with St. John's Lutheran Church in Vesta, with an "e" and located in Redwood County. No, I don’t drink coffee in the church basement; only rarely anywhere. No, I don’t eat lutefisk. No, I don’t especially like red Jell-O. Yes, I eat hotdish. Yes, I studied Luther’s Small Catechism. Yes, I’m proud of my German Lutheran heritage. Today marks Reformation Sunday, that Sunday when all good Lutherans commemorate the Reformation led by Martin Luther. I’m going to let you in on a little secret here. When I was a wee girl attending St. John’s Lutheran Church in Vesta, memorizing the Ten Commandments and all the parts of the Catechism, I was confused by Martin Luther and Martin Luther King Jr. It took me awhile to realize the teacher and pastor weren’t talking about the same man. We sang all those wonderful old hymns like “A Mighty Fortress,” “Just As I Am” (which always reminds me of Billy Graham), “The Church’s One Foundation,” “Take My Life and Let It Be” and “When the Roll is Called Up Yonder” (which was unfamiliar to me, but apparently is a tent revival song). I take comfort in singing those hymns of old, so deep and rich and soul-connecting. Accompanied by string instruments and a piano during this morning’s worship service at Trinity Lutheran Church in Faribault, the words seemed almost poetic. Lovely. Just lovely to sing. And the pastor’s words were reaffirming as he preached that the Reformation is about “God’s amazing grace in Jesus Christ,” a message that has been around since the days of Adam and Eve, way before Martin Luther. Reformist Luther, he said, “chose to follow the Scriptures,” that salvation comes through Christ and not by anything we can do. The salvation part didn’t surprise me; it was the “denominations” part. 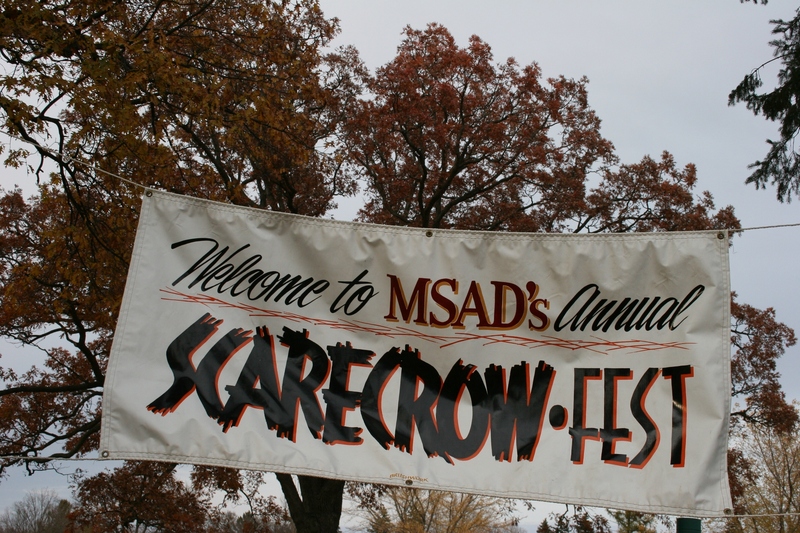 FROM EGYPT TO INDIA TO MEXICO…, you’ll find those countries and more represented at this year’s Minnesota State Academy for the Deaf Scarecrow Fest. 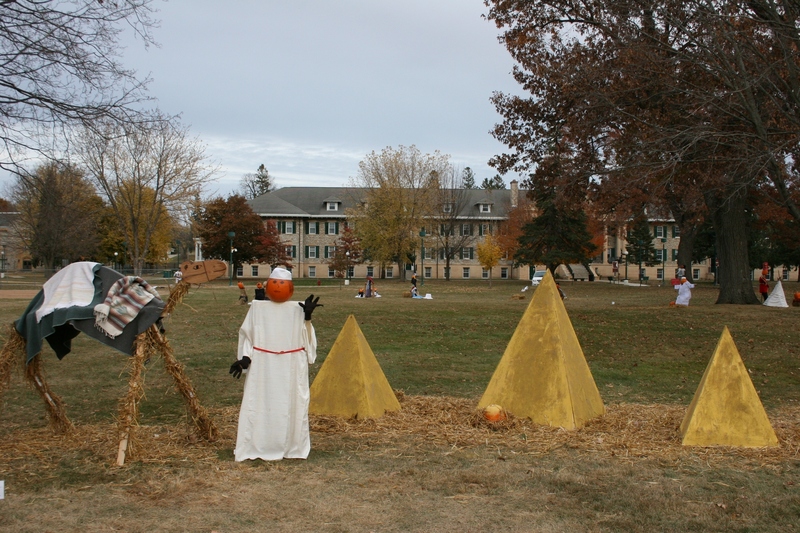 Autumn wouldn’t be quite the same without this annual display at the school’s picturesque campus on the east side of Faribault. For years my family has toured the scarecrows showcased in the school’s green space edged by lovely, historic limestone buildings. Unlike past festivals, the scarecrows this year hadn’t been ravaged by the brisk winds that often sweep across this hilltop location. 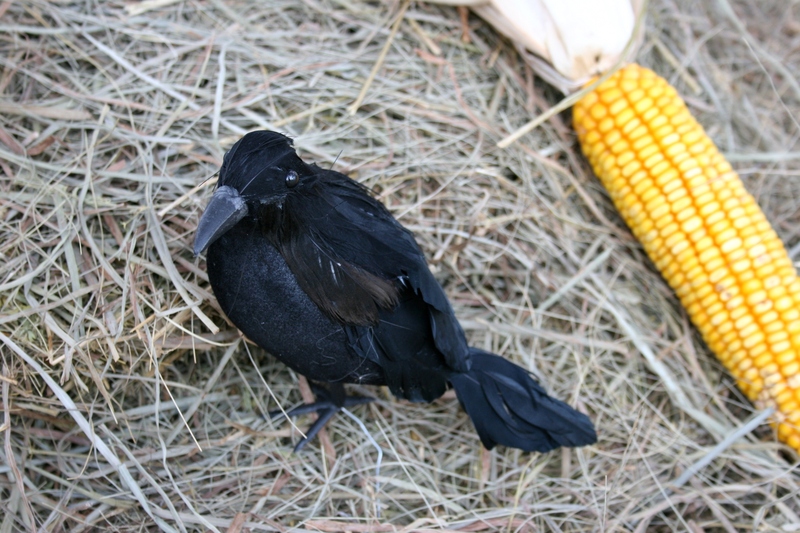 Durability is a requirement in construction of the scarecrow scenes, which are also judged on use of materials, overall appearance and creativity. I don’t know how judges decided on the winners this year because so many entries in the themed “Cultures of the World” contest ranked as outstanding. MSAD classes, public school classes, dorm groups, community groups, families and staff can enter the competition. This year’s theme, especially, pleased me given the ever-growing cultural diversity that defines Faribault. 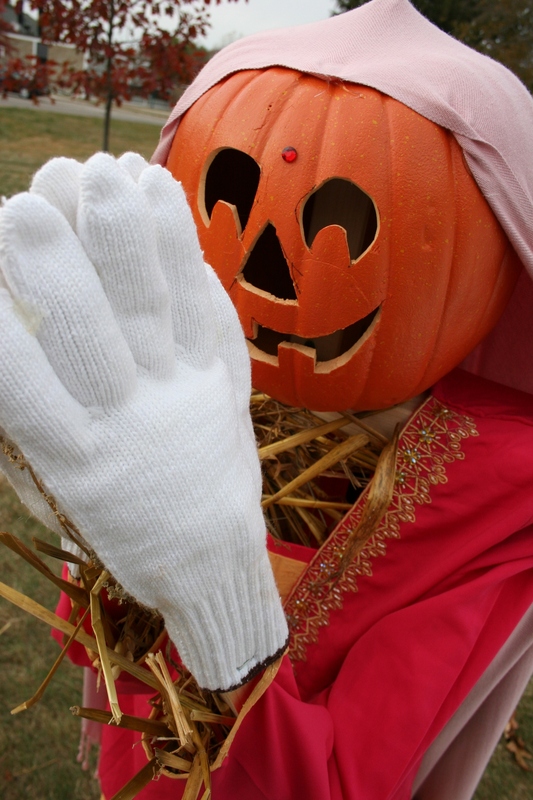 If you want to see the scarecrows in person, you best hurry. 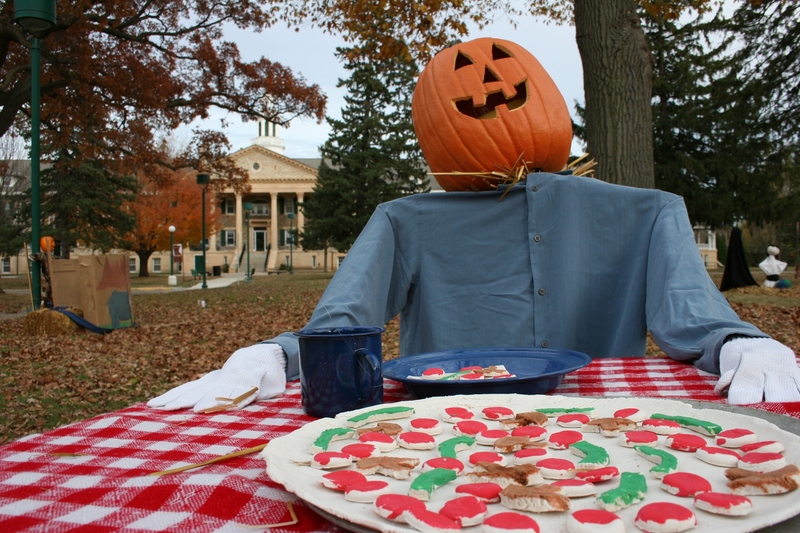 The displays went up a few days ago, will remain up until Halloween, and must be removed from the campus on Tuesday. 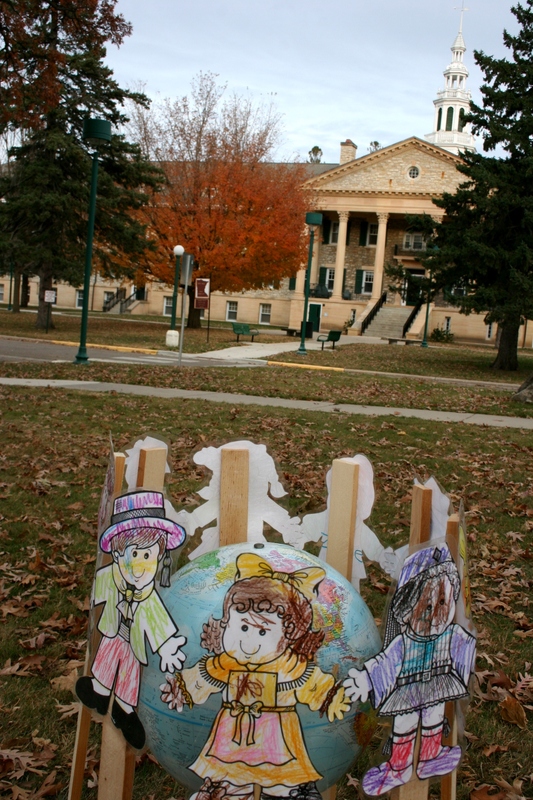 "International ECE Children" by the MSAD ECE with historic Tate Hall in the background. A close-up of "Barn Raising Rebels" by the Faribault High School American Sign Language Group 3. A detail in the "Barn Raising" scene that made me pause and wonder if this blackbird was about to take flight. "Italian Pizzeria" by the MSAD ECE won third place. 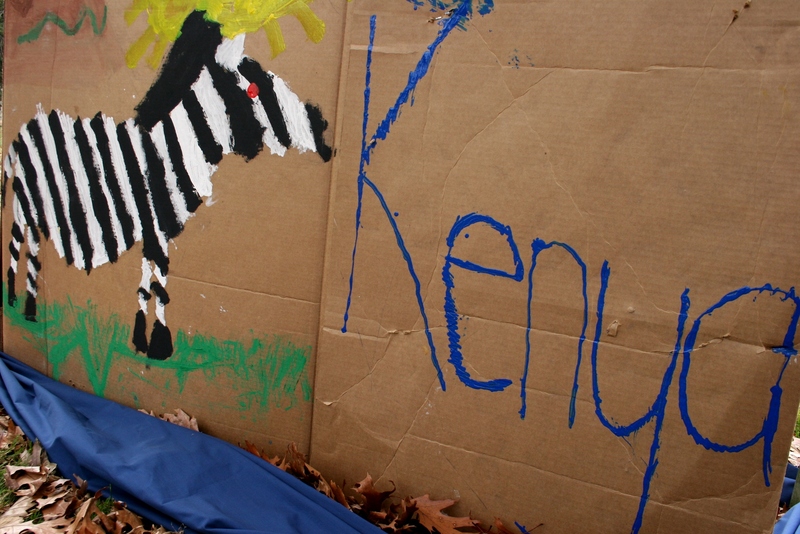 Animal art in the "Kenya" display by MSAD grades 2/3. "Welcome to Egypt" by the MSAD Class of 2015 included an Egyptian, a camel and three pyramids. 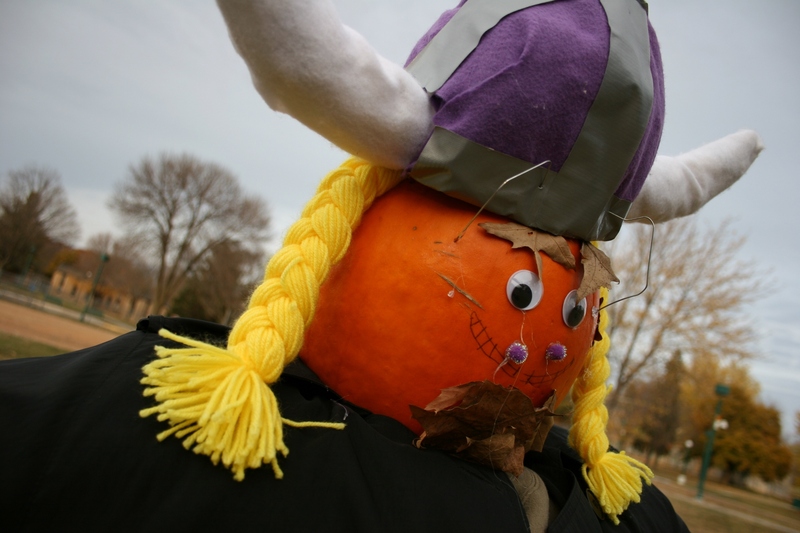 Viking Leif Erickson was part of the "Greenland" scarecrow scene by MSAD grades 4/5. The entry won second place. 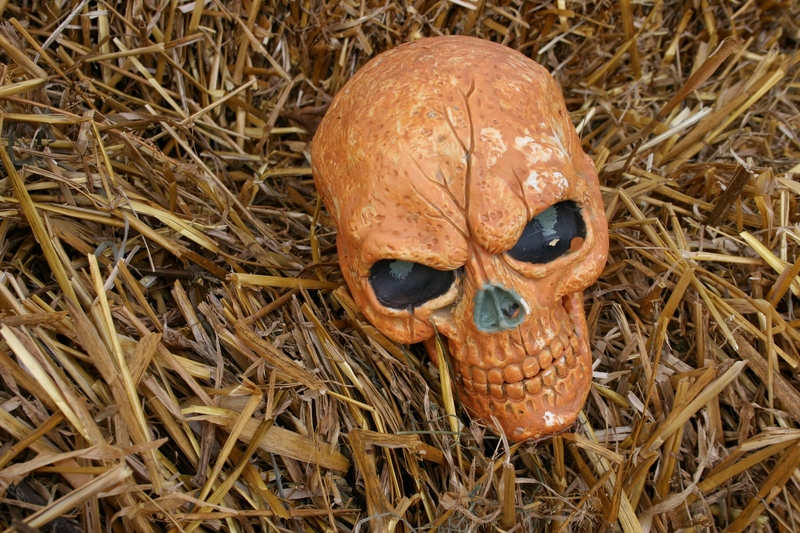 Several skulls were incorporated into "Mexico's Day of the Dead" by MSAD Class of 2013. 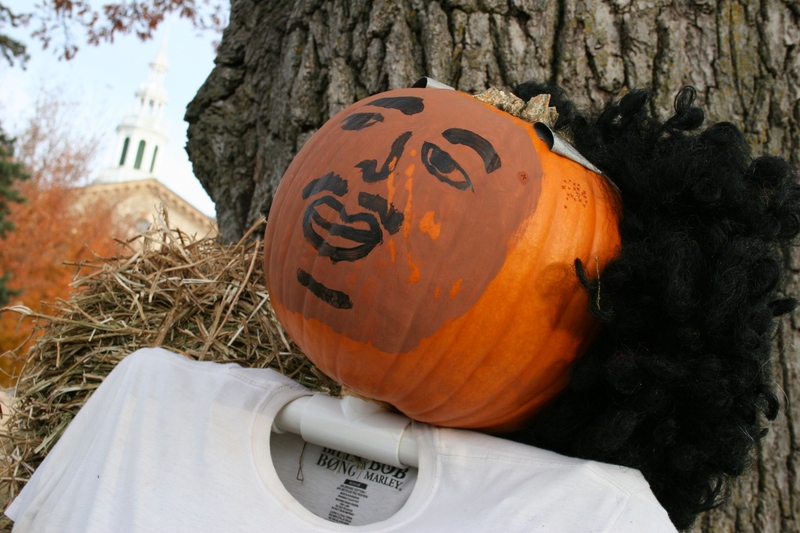 Faribault High School's American Sign Language Group 1 created this Jamaican. 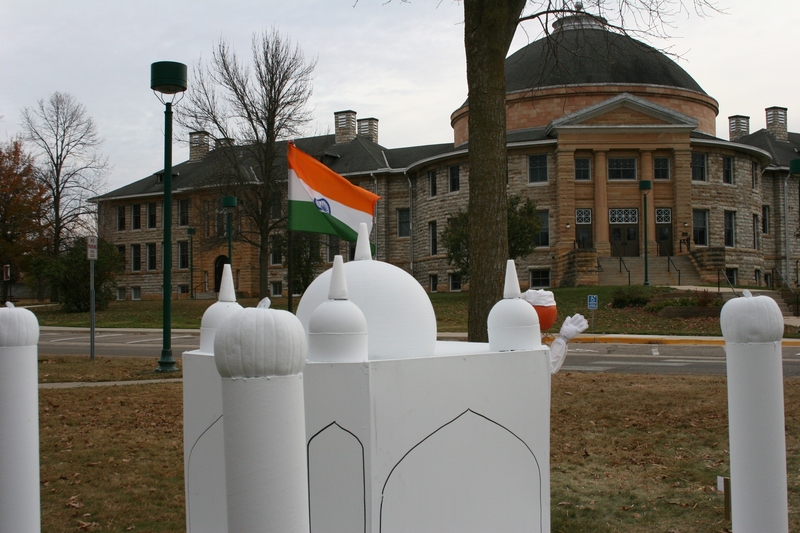 The Baker family built the Taj Mahal, which mimics the shape of Noyes Hall in the background, for their "Welcome to India" scarecrow display. The Bakers won first place. 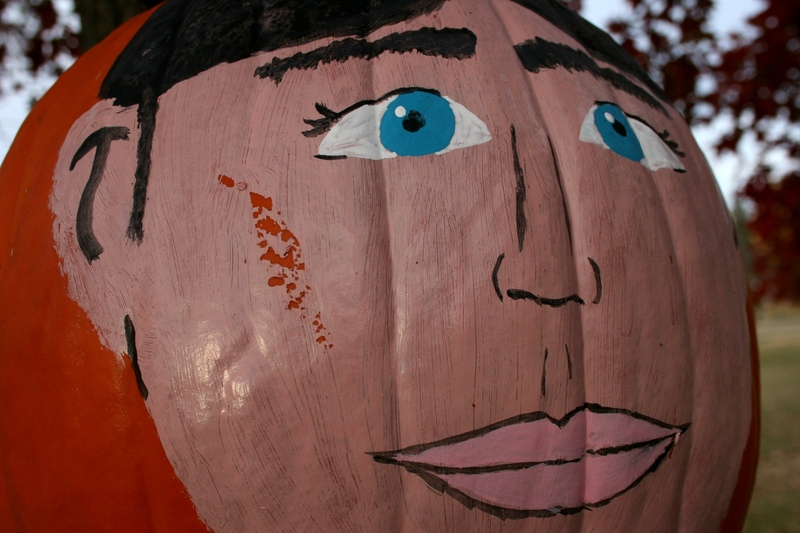 The Baker family got the details, right down to the jewel on the Indian woman's forehead. MENTION KOREA and my thoughts automatically flip to my father, a veteran of the Korean Conflict, or Korean War, or whatever title you want to attach to that hellish war. 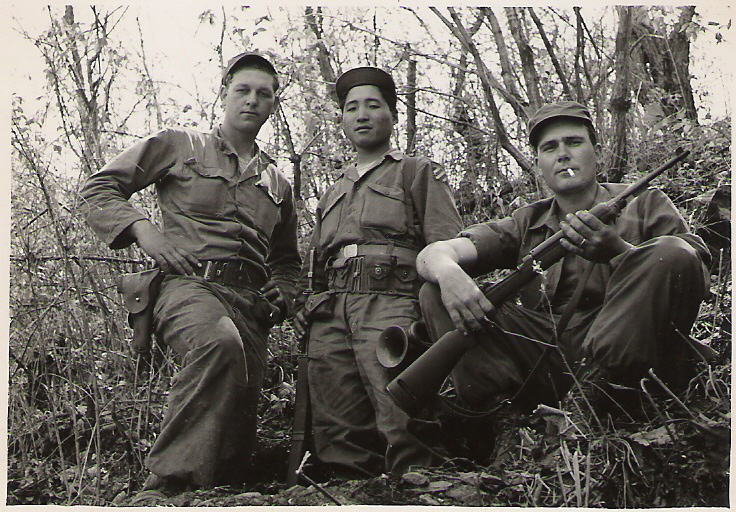 My dad, Elvern Kletscher, fought on the frontline in the cold, cold mountains of Korea. He killed men so close he could see the whites of their eyes. He saw a buddy blown apart in front of him, the day before Ray was to return home to the States, to Nebraska, to see his baby daughter for the first time. Shrapnel struck my dad at Heartbreak Ridge and embedded into his neck. Just like all those awful experiences that embedded into his memory. Horrible, nightmarish memories he could never shake. Never. So I am thinking of my dad today as I pull together this post about how the Historic Hutchinson House Bed and Breakfast in Faribault is honoring qualifying veterans by giving away a free night’s stay in the B & B’s five guest rooms on November 10. The give-away coincides with the Faribault Community Theatre’s production of M.A.S.H., which opens tonight and continues at 7:30 p.m. October 29 and 30 and November 3, 4 and 5 and then at 2 p.m. on October 30 at the Paradise Center for the Arts. Volunteers at the Paradise Center for the Arts promoted M.A.S.H. 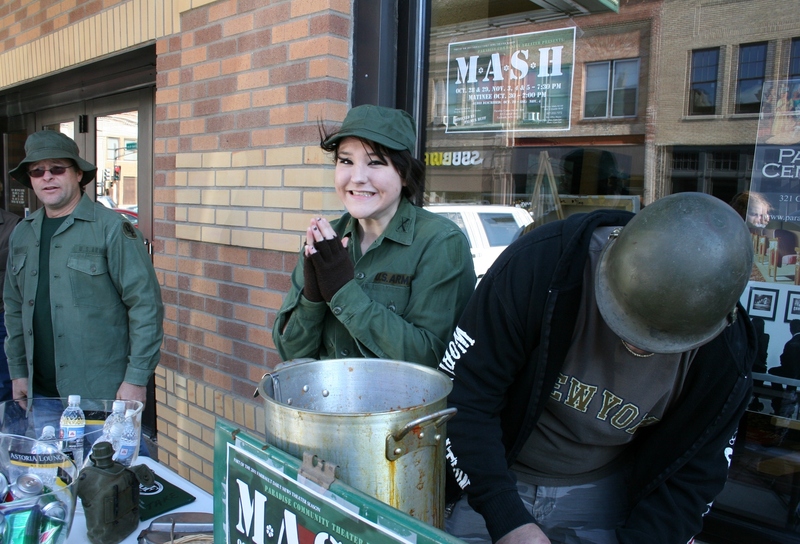 and served chili samples at the recent Faribault Fall Festival and Chili Cook-Off. Tami Schluter, who co-owns the Hutchinson House B & B with her husband Doug, came up with the give-away idea after M.A.S.H. director Palmer Huff asked his cast for a way to honor veterans as part of the theatrical performance. M.A.S.H. tells the story of the 4077th Mobile Army Surgical Hospital based in South Korea during the Korean War and Tami plays the part of chief nurse, “Hot Lips” Houlihan. The Schluters last year participated in a program among North American B & Bs offering free rooms to veterans on November 10. So it was a natural to open their 1892 Queen Anne-style Victorian home again to veterans at no cost for one night “to say thank you to all those who have served our great country,” says Tami. Those selected for the complimentary one-night Hutchinson House R & R (with a guest), and a three-course breakfast the following morning, will come from among qualified active and retired military personnel. To qualify, registrants must attend the M.A.S.H. production at the Paradise and leave their contact information in the theater lobby drop-box. Proof of veteran status will also be requested. Winners’ names will be drawn on Sunday, November 6. Then, on November 10, the honored veterans and their guests will meet “Hot Lips” Houlihan, aka Tami, at her B & B. If my dad was still alive—he died in 2003—I’d invite him to attend M.A.S.H. with me and try for that free night at the Historic Hutchinson House B & B. My Purple Heart-pinned father would have been so deserving given all he’d been through on the battlefields of Korea. Instead, I’ll just cross my fingers and hope a Korean War veteran is among those who win the one-night get-away and awaken on 11-11-11, Veteran’s Day, to that three-course gourmet breakfast served by the Schluters. 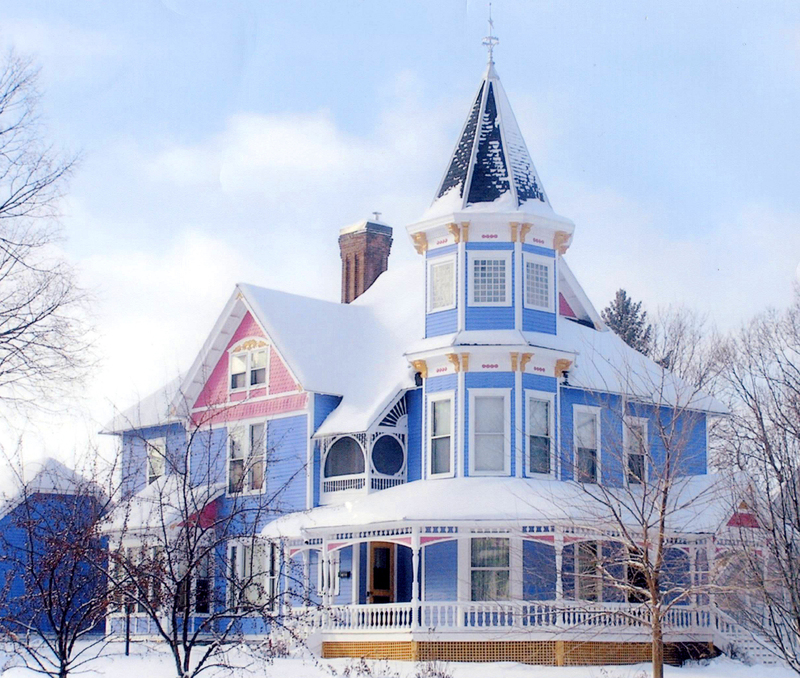 FYI: Three other Minnesota B & Bs are participating in the B & Bs for Vets Program: Hillcrest Hide-Away B & B in Lanesboro, Deutsche Strasse B & B in New Ulm and Classic Rosewood Inn in Hastings. According to online information, rooms for vets are already filled at the Lanesboro and New Ulm B & Bs. To check out the Historic Hutchinson House B & B, click here. For information on the M.A.S.H. production at The Paradise Center for the Arts in downtown Faribault, click here. TO READ A STORY I wrote about my father’s time in Korea, published in 2005 in God Answers Prayers Military Edition–True Stories from People Who Serve and Those Who Love Them, click here. This collection of military stories was compiled by Allison Bottke and published by Harvest House Publishers. LARRY GAVIN once lived in Belview. 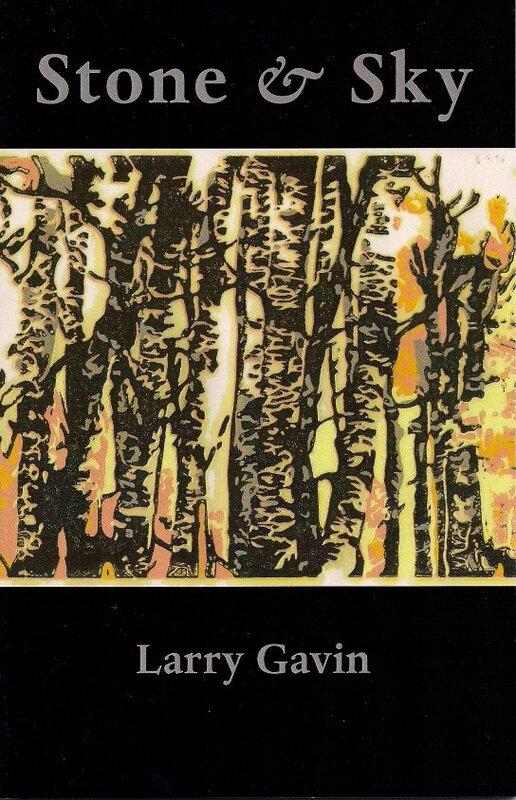 Well, dear readers, especially readers of poetry, Larry Gavin is a poet. He moved to Belview, a southwestern Minnesota prairie town of 375, to study writing with great writers like Howard Mohr, Leo Dangel, Fred Manfred, Joe and Nancy Paddock, Phil Dacey, Robert Bly, Bill Holm, Don Olsen and many others. Do you recognize some of those names? You should. I’m not trying to be uppity here. But Bly, who was born in Madison (Minnesota, not Wisconsin) and still lives in the western part of our state, is one of Minnesota’s most distinguished poets. Holm, a well-known essayist, author and poet, wrote numerous books, including Boxelder Bug Variations. Up until his death, he lived in his prairie hometown of Minneota (Minnesota without the “s”), where residents celebrate Boxelder Bug Days. Howard Mohr penned How to Talk Minnesotan, a must-read for every transplant to our state. 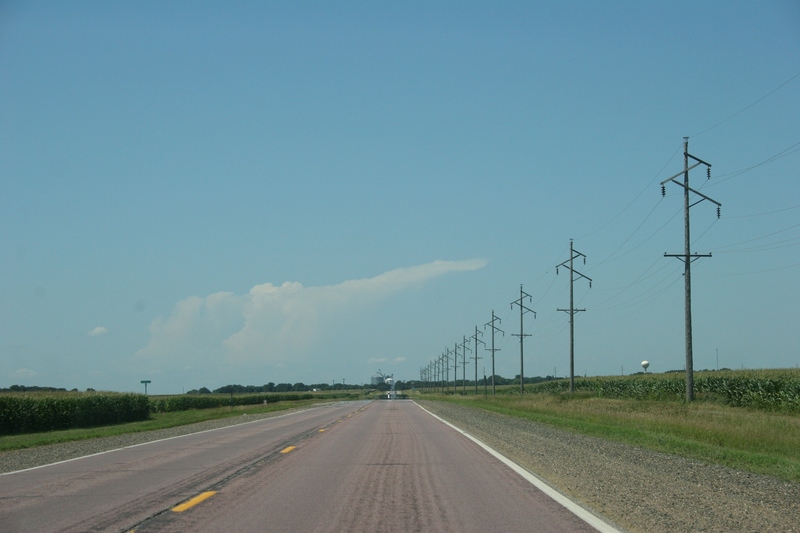 Driving through the southwestern Minnesota prairie near Morgan, about 25 miles from Belview. Larry Gavin learned from these great writers of the prairie, where he lived for 15 years many years ago. Gavin made his home in Belview, just off State Highway 19 and some 10 miles or so from my hometown of Vesta. He served as the town’s mayor for two terms and taught English at Redwood Valley High School, back then Redwood Falls High School. It is that connection to my home area and our shared love of language and writing and of the prairie that has connected me to Gavin, who today lives in Faribault and teaches English at Faribault High School. At least one of my daughters, if not both, has been taught by him. We both won Roadside Poetry competitions–Gavin the first in 2008 and me, this past spring–and had our four-line poems showcased on billboards in Fergus Falls. I once asked Gavin to read one of my poems at a local author event. Gavin is meant to read poetry. He has the kind of rich, deep voice from which words flow with the rhythm and inflection of someone who clearly loves language. 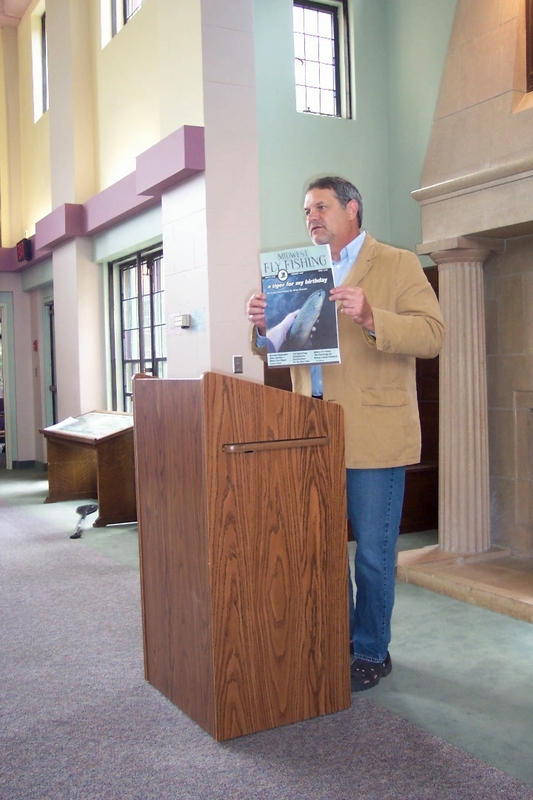 Larry Gavin during an author event at Buckham Memorial Library in Faribault. Gavin is also meant to write poetry. And he’s written enough to fill three slim books—Necessities, Least Resistance and his just-released Stone & Sky. All have been published by Red Dragonfly Press, a noted not-for-profit literary press based in Red Wing. When I read Gavin’s poetry, I can sense his deep connection to the land and to nature, shaped, I would like to think, partially by his years on the prairie. When you live on the stark prairie, where the land stretches flat and far and where the sky dwarfs all else and where the wind blows nearly unceasing, you can’t help but write with a strong sense of place and with detail. I see that in Gavin’s poetry. In his newest book, Stone & Sky, I read of woods and firewood, of raccoon tracks and a walk along a deserted street. Of stone and sky and snakes. I recognize places from here, in Faribault. I recognize, too, prairie-influenced writing. I don’t pretend to understand every poem in Gavin’s latest collection. But poetry is always open to interpretation and that which I may not find meaningful today I may come to understand at a later time. All that said, I posed a series of questions to Gavin, who has written more than poetry. For fifteen years he worked as a field editor for Midwest Fly Fishing magazine, taught at the magazine’s school in Montana in the summer and helped with the Chicago and Minneapolis fly fishing expos each spring. He currently writes for Outdoor News. My questions to him, however, specifically address his poetry writing. I found his answers insightful and, at times, surprising. Q: How long have you been writing poetry, why, and when did you consider yourself a poet? A: I started writing poetry in sixth grade and that’s when I started considering myself a poet. I’ve written ever since. Q: What inspires you and/or influences your poetry? A: Work inspires me. Everyday I get up and write something. I don’t miss a day. Inspiration has very little to do with it for me. I like working out ideas and problems in writing each day. Q: How would you define your poetry style and content? A: I consider myself an inheritor of the great romantic tradition of poetry. That, in my mind, goes from Wordsworth to Yeats and Hopkins to Robert Frost and Wallace Stevens, to Gary Snyder and others. The natural world as reflected and defined by human thought and feelings. The great gift we give to the world is our thoughts and feelings about big issues: transcendence, hope, justice, peace, and love. Q: This is your third collection of poetry issued by Red Dragonfly Press. What was the process to getting published by this well-respected Minnesota press? A: Scott King is the publisher and I submit a manuscript to him. He responds either yes or no and if he accepts it the manuscript gets in line to be published. The most recent book took about four years to appear. Publication is based on press funding and a variety of other factors. I’m patient and not particularly ambitious. Q: Tell me about the content and theme in your first two collections, Necessities and Least Resistance. A: They are very different from one another. The poems deal with the natural world as seen through simple objects and ideas. They attempt to make sense of complex subjects like love and our interaction with nature in a pure form of language, and the tools poetry gives us like meter and rhyme. The poems are an explication of the world in the context of the universal individual. Q: Stone & Sky just released. It’s an interesting title. How does the title tie in with the content? What is the common thread running through the poems in this collection? 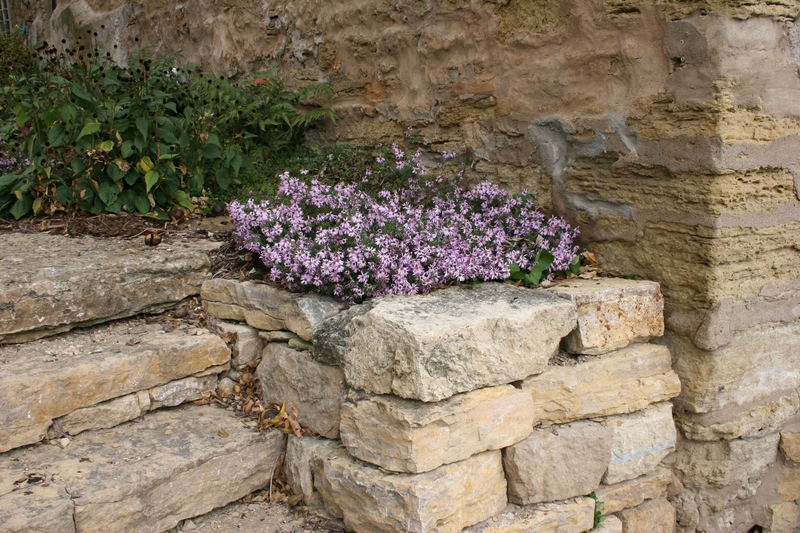 A: Stone & Sky stretches the boundaries of what is real. It looks at the world in a more magical way. Not magical as fabricated but more magical as mystical – as another way of being real. The language, the images, and the poems stretch the boundaries of what is real and hopefully get at reality in a new way. They are still anchored in the natural world, still anchored in the local, but the themes, like the title, are basic, elemental. Q: If you were to select your favorite poem in Stone & Sky, which would it be and why? How about a favorite line? A: Actually they are all favorites right now. And you have to remember, I’m on to new things after four years. Q: Your love of nature shines in your writing. So does your love of language. How do you combine the two into poetry that sings with descriptive lines? How do you know when you’ve “nailed it,” when you have a poem exactly where you want it? A: The old elements of poetry combined in new ways. Rhyme, meter, repetition – give poems life. Everything is a work in progress; they’re never really finished. Q: Are you working on another collection? Or are you simply just always writing poetry? A: My next collection is called The Initiation of Praise and I’ll start sending it out soon. I also have a selected works which focuses just on outdoor poems. I’m also working on some short stories, and I write an article each week as well. READERS, Stone & Sky is available from Red Dragonfly Press at www.reddragonflypress.org and also at Monkey See Monkey Read (in person or through internet sales), an independent bookstore at 425 Division Street, Northfield. Eventually, Stone & Sky will also be available through Amazon. Cover cost is $10. J. Ingebretsen's av Stockholm on a corner in Stockholm. 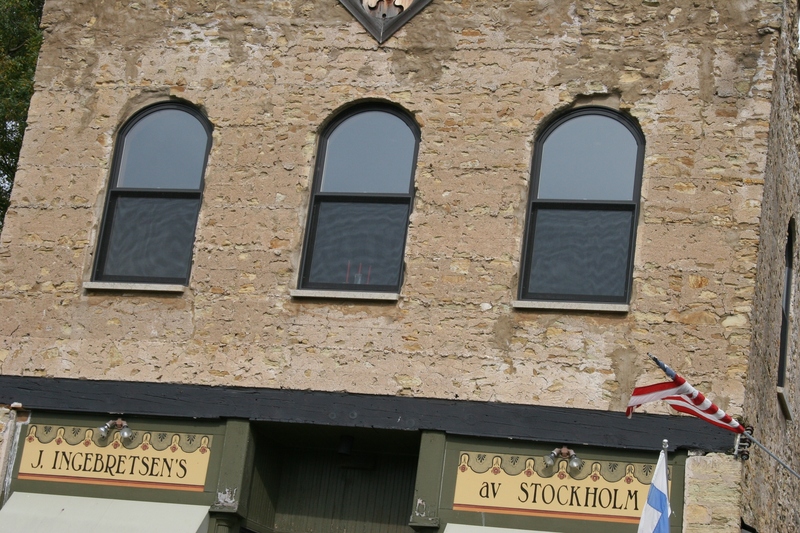 STEP INSIDE J. Ingebretsen’s av Stockholm along Wisconsin Highway 35 in Stockholm, Wisconsin, population 89, and a sense of serenity sweeps over you. Perhaps it’s the Scandinavian influence. Or perhaps it’s the charm of this quaint Lake Pepin-side village casting a spell upon you that evokes a feeling of peace. The sign suspended from the front of Ingebretsen's, if I got the translation correct, means "crafts." 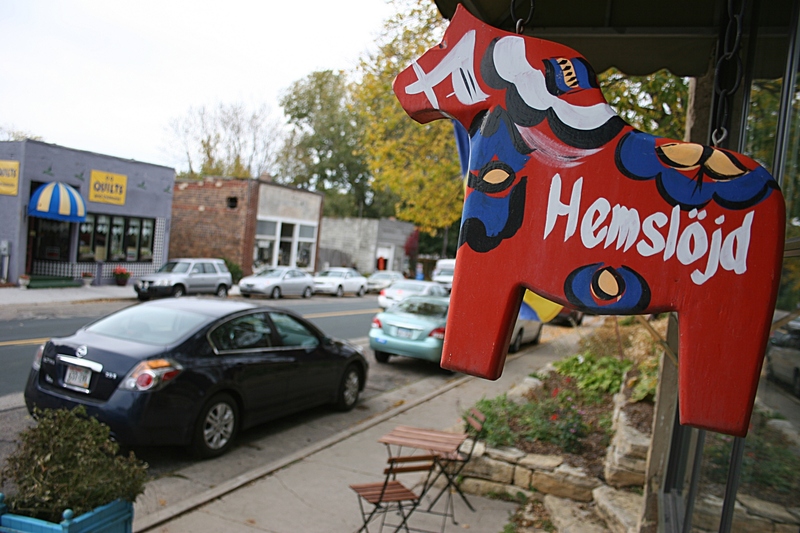 The dala horse is a popular Swedish symbol. 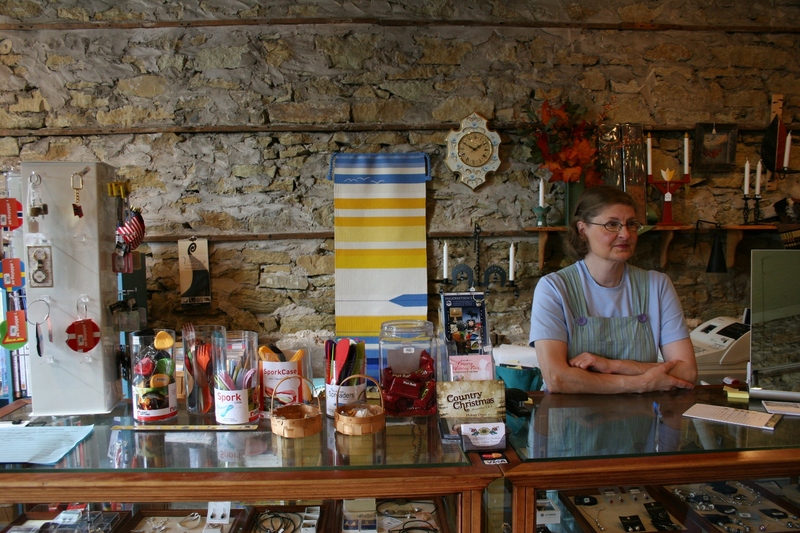 No matter the reason, the atmosphere inside Ingebretsen’s, a Scandinavian gift shop, conveys a sense of orderliness, simplicity and a feeling that all is right with the world, or at least in this part of western Wisconsin. 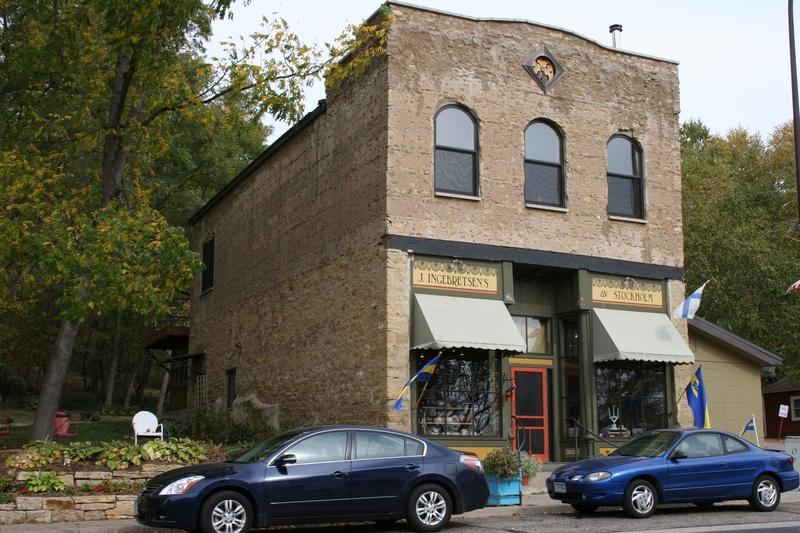 On a recent day trip from Minnesota across the Mississippi River, my husband and I discovered this wisp of a village, which, except for all those inviting shops lining the main drag and side streets, would likely stand as another shuttered small town. But Stockholm hums with activity, its streets packed with vehicles, its sidewalks teeming with folks drawn here by the quaintness, the laid-back feel of this historic place, the smorgasbord of shops that range from precisely orderly Ingebretsen’s to cluttered, books-tilting Chandler’s Books, Curios. Step inside Ingebretsen’s, an offshoot of the main store in Minneapolis, and you’ll forget the traffic only steps away along Highway 35. You’ll focus instead on the display of dala horses. You’ll draw your hand across woolen blankets that ward off the chill of autumn, soon-to-be winter. Your eyes will turn toward the earthen-hued pottery lining shelves. 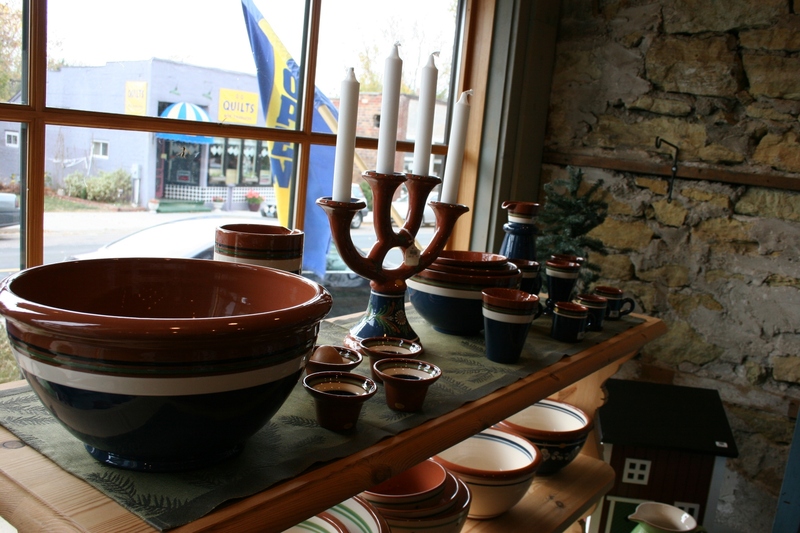 Inside the front window of Ingebretsen's, lovely pottery. 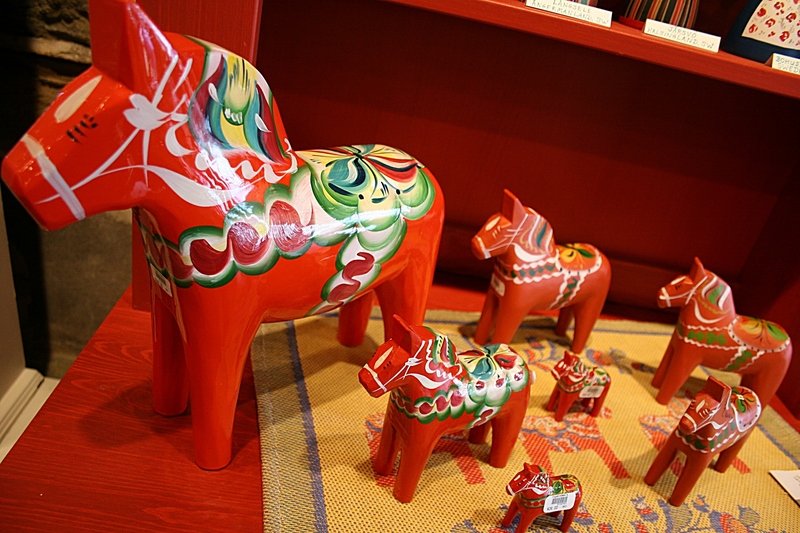 A collection of dala horses inside Ingebretsen's, a traditional symbol of Sweden. As the story goes, woodcutters from the province of Dalarna whittled away the long winter months carving these toy horses for children. Even the pleasant shopkeeper with her crisp apron and refined demeanor fit my image of a Scandinavian. I immediately fell in love with the rough stone that defines this historic building. You’ll admire the rough stone walls of this 1878 building, first used as a general store, then as a hotel, hardware store, confectionary, barbershop, speakeasy and café. Before it was abandoned and then reborn several years later, in 2003, as this Scandinavian import shop in Stockholm. The upper level of the restored Ingebretsen's building. It's all about the details in Stockholm, like this clutch of flowers hugging stone at Ingebretsen's. PLEASE READ my previous post published October 24 on Chandler’s Books and watch for more stories from Stockholm.